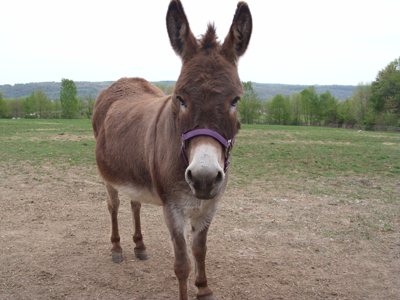 ​Donkey joined our herd in November 2008, and is a permanent resident. My husband remembered a story I had told him when we were dating, about my having wanted a "Christmas donkey" ever since I was a little girl, because I liked the story of how the donkey came to have the dorsal & shoulder markings that formed a cross. He found Donkey at a local auction & my husband bought him for me as a birthday present. What makes this story interesting is the hip, or auction number, that Donkey was assigned. When we first saw him, he hadn't yet been checked in, so didn't have a hip number. When he was in the ring, our attention was on the bidding, so we didn't notice the hip number. However, after the auction, when I went to give Donkey some hay & water, I saw the hip number & was stunned - the 4 digit number was exactly the month & day, in that order, of my birthday. Some things are just Meant To Be. Donkey like to help us when we take videos and photos of the horses.